College-age students often struggle as they learn to independently manage themselves. Weaknesses in Executive Function skills can become more apparent in the less structured environment of college life. Often for the first time, college students lack scheduled school or parent support and must plan and take the initiative to stay on track. Parents are faced with a dilemma as they wonder how to provide support without hindering their student’s independence and self-confidence. Meanwhile, parents worry about jeopardizing their investment in tuition if students cannot maintain the grades required for graduation. What Executive Function Skills are Expected in College? While some students seem to develop these skills seamlessly over their academic careers, many struggle and benefit from a level of direct 1:1 instruction and support that is unavailable in most colleges. 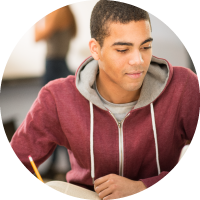 Find out how Executive Function coaching can benefit your college student. I would say the best part of my coaching is that it keeps me on track and offers some accountability, without being forceful, or annoying. I have learned a lot of new organizational techniques for note taking, and...coaching keeps me on track and aware of my deadlines, as well as pushes me to a higher level of understanding of the material in my classes, as I discuss it with my coach over Skype, and make an effort to improve...more often than not, the tips and help from coaching will benefit you in the long run.